Wow! That's a giant picture! I'm trying out giant pictures... what do you think? This Big Bowl of Dinner is one of my most favorite meals for super quick weeknight dinners (or lunches). The whole thing takes about 10 minutes. You can't see it, but there's a big pile of delicious refried beans under all those veggies. Mmmm. Some nights, I don't get home from teaching until about 9 pm, and I am hungry. This is a perfect option for those nights - beans, veggies, and flavor. Perfect! Here's the "recipe" - if you can call it that! Scoop the can of refries into a small pot. Add 1/2 the tub of fresh salsa, and the ground cumin. Mix it up. Turn the heat to medium high. Once it starts to burble a little, give it a few good stirs and turn the heat down to simmer. Meanwhile, if any of your veggies need steaming, now is the time. I usually steam my broccoli or kale for about 8-9 minutes. Once your veggies are done steaming, turn off the burner, and turn off the heat for the beans. Pour half of the beans into each bowl. 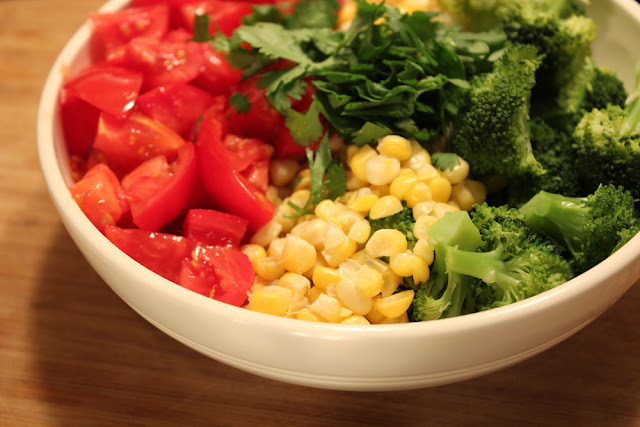 Put half of the veggies in each bowl. Garnish with lime and cilantro. Enjoy your dinner that took you 10 minutes. For today I didn't do a doodle... I hope you don't mind! 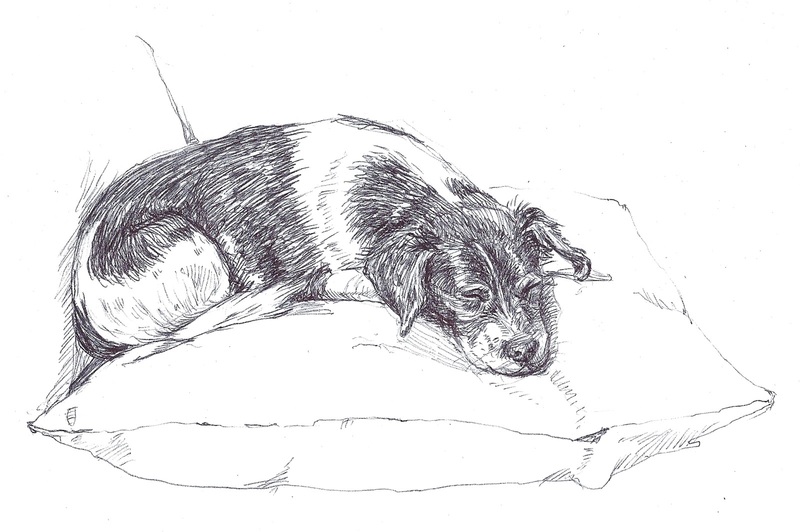 Instead, I did a little portrait of Mr. Snoopy sleeping on his favorite pillow on the sofa. Usually, when I try to sketch one of our pets, they flip over or jump up to bark at something within minutes... but little Snoop just kept on snoozin'. Snoopy is our littlest dog and he is really awesome. I think he's a Beagle - Dachshund - Chihuahua - Jack Russel mix. He's as cute as a puppy, even though he's going grey. I think he's probably about 9 or 10 years old. He is so snuggly. My favorite thing about him is that every night he sleeps with me, all curled up in my armpit - with his little chin resting on my shoulder. I love it so much, it's crazy. He's like a little dream come true. I love the big photo and your bowl looks super fresh & tasty. that's crazy! what's the problem. I love eating dinner bowl - plus: it's only one dirty dish! And all the good stuff mixes together. Sorry you have to live with a bowl-hater. Awwwww. I love your Snoopy portrait so much! And that bowl, too. I had no idea you were a teacher! What grade do you do? I teach piano which isn't quite the same as school, but it's good times. That sketch of yours is gorgeous, you've really got a knack! allysia, actually, I'm a yoga teacher! I love it so much. How cool that you are a piano teacher... between you and me, we are keeping the people of the world recreationally occupied! Now I know what to fix for dinner. I love the idea of one pan, one bowl, easy meal. I love big bowl dinners. Nice sketch! You've really captured his sweet nature. Whenever my dog saw me coming with the sketch book he's try to leave the room because he knew I'd want him to stay still for awhile. ha ha, what a naughty dog! :) Animals are so fun to sketch... but they can be very fidgety too. Mr. Snoopy! And yay for the big picture of the big bowl dinner! big pictures are good to go! Big Bowl of Dinner!!!!!! This sounds like the perfect use of my leftover refried beans in the freezer. Canned vegetarian refrieds are the BEST dinner shortcut! Your bowl sounds delicious, and your sketch of little Snoopster is wonderful! Wow, the sketch of your Mr Snoopy is awesome! Your dinner bowl looks great too. First of all, I love refried beans and salsa and cilantro! Your big bowl looks amazing. Second of all, you are such a wonderful artist! Your pictures and doodles and drawings are all so impressive. I am in awe! 10 minutes sounds exactly like what I need. And since these days I am looking at everything from a kid friendly perspective, it looks very kid friendly, too. And your drawing! That is super gorgeous, Amey! I totallyt hink it's kid friendly. Depending on the salsa you used... because I don't think the kiddos would want it to be too spicy! Yum, I love refried beans but don't eat the nearly enough. This sounds perfect! And that sketch is beautiful! My dogs won't stay still long enough for a photo, let alone a sketch. Our smallest one, Pants sleeps in the bed too- every night she falls asleep near our feet, but when we wake up in the morning she's under the covers with her head on a pillow (or an arm). She's in severe denial about not being human. ha ha! I love that you have a dog named Pants! Excellent! I like the giant picture, and I love zoomed-in-all-the-way pictures of food! Amey you are so talented! Mr. Snoopy's portrait is amazing! Are you naturally talented or did you take classes or both? I'm jealous! You are so crazy talented! I love that you have little Snoops in your life. I love your beautiful drawing, and Snoopy sounds so sweet! Bowls are my favourite for quick meals, too, but I've never tried one with refried beans. It looks super tasty.